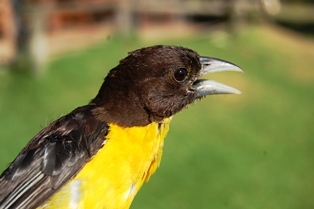 The Dark-backed Weaver Ploceus bicolor is bright yellow below and dark above, the throat is solid black or mottled black and yellow. The sexes are alike (photo left). Juveniles (photo right) are duller than adults, have a mottled throat, and pale bill. The wing edges are dark (unlike Clarke's Weaver P. golandi. 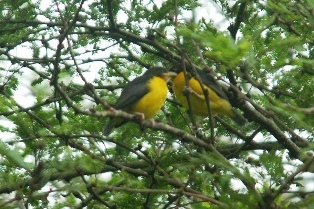 P. b. bicolor in E Cape to KwaZulu-Natal in South Africa (see yellow on map). P. b. tephronotus in SE Nigeria, Cameroon, Bioko Island, Gabon and western Congo (see dark green on map). The crown and nape are brownish black, mantle slate-grey, and the throat is brownish black flecked with grey. P. b. amaurocephalus in Angola and southern DRC (see blue on map). The crown and cheeks are brownish black, mantle and throat grey. P. b. mentalis in South Sudan, NE DRC, Uganda, and western Kenya (see grey on map). The back is dark grey, crown and cheeks black, throat black or sometimes yellow and black. P. b. kigomaensis in Rwanda, Burundi, east and SE DRC, Zambia, extreme SW Tanzania (see light green on map). The throat feathers are tipped with yellow but throat is more blackish than amaurocephalus. P. b. kersteni in S Somalia, coastal Kenya, E Tanzania south to Rufiji River, and Zanzibar Island (see orange on map). The upperparts are entirely black. 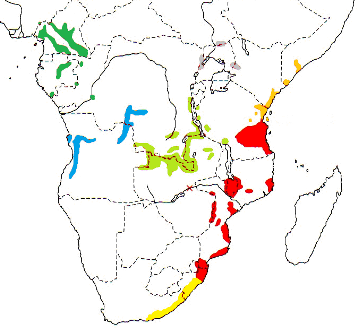 P. b. stictifrons, coastal Tanzania from Kilwa southwards, S Malawi, E Zimbabwe, Mozambique to northern KwaZulu-Natal in South Africa (see red on map). The upperparts are greyer and more olivaceous than other races, and the forehead feathers are tipped whitish. The song of the Dark-backed Weaver is often a duet, with the male and female singing the same elements in a nearly simultaneous sequence, after some introductory notes which show increasing synchrony. There are local dialects in this song which appear to remain stable over many years. There are large-scale differences in song between geographically separated populations. The youg apparently learn the song from their parents and other adults, and the song type stabilizes within the first two years. The Dark-backed Weaver inhabits forested areas, including riverine and gallery forests in open country, and second-growth forest regenerating after shifting cultivation, coffee forests, denser patches in dry baobab woodland, and in South Africa dry Valley Bushveld. It joins mixed-species flocks of insectivorous birds. This species forages in the tree canopy and at the leafy ends of branches. Food items are mostly arthropods, including grasshoppers, beetles, caterpillars, bugs, flies and spiders. Other food items are berries, fruit, and nectar. The longevity record for Dark-backed Weaver is over 5 years in the wild, but can be expected to be much more (see news item. The Dark-backed Weaver is a monogamous, solitary nester, with the pair-bond lasting for several years. The nest is retort-shaped. The entrance is extended into a spout that is usually <30cm long but may be up to 60 cm. The nest looks rough because it is made of stiff materials such as thin vines and creepers. A pair usually nests in the same area each year, so there may be 2-3 nests close together. One nest took 7 days to complete, and another took 9 days. Although nests are often high, and at the end of twigs, snakes do reach them and take young. The Dark-backed Weaver has 40 PHOWN records, covering most subspecies, but no records yet from the West and central African races. Many more PHOWN records are needed for this common species (see PHOWN summary), to determine nest site fidelity, breeding density, etc. Look out for old nests which may be taken over by Grey Waxbills Estrilda perreini or Green Twinspots Mandingoa nitidula. Submit any weaver nest records to PHOWN (PHOtos of Weaver Nests) via the Virtual Museum upload site.